Turning your living room into a listening room… one especially designed for tube amplifiers. The two main components determining room acoustics are absorption and reflection. Auditoriums and concert halls on one hand are intentionally designed to have reflective surfaces that make the music ‘come alive’ and spread over the audience. They are reverberant spaces; spaces were the sound bounces around many times before slowly dying away. Your living room, on the other hand, needs to be exactly the opposite. While the best concert halls have surprisingly little absorptive material, your living room needs a lot of it. Its dimensions are smaller, creating reverberation that does not add the great open sound character of Boston’s Symphony Hall, but instead, adds a sonic muddle of confusion. Good recordings already having the sonic footprint of the carefully designed recording studio or concert hall, and don’t need your living room adding its own sonic footprint on top of that. Instead, your living room needs to absorb as much sound as possible. It needs to be acoustically dead. 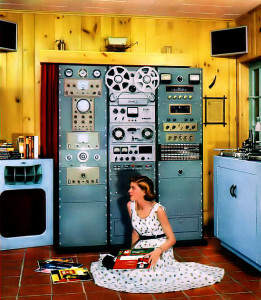 Listening rooms generally have a “quietness” about them. It should be easy to carry on a quite conversation. This quality of quietness comes from having a good percentage of all surfaces covered with acoustically absorptive materials. These can be heavy drapes, thick carpets, pieces of stuffed furniture, etc. Openings to the rest of the house also help by letting sound escape down the hall where it is more likely to be absorbed than reflected back. Different than absorption, but also desirable, is the scattering of sound, or sound dispersion. A large flat surface bounces sound waves back as an echo, creating a sonic harshness that upsets the balance of sound. Anything that breaks up a smooth surface will scatter or disperse reflected sound in multiple directions, reducing the severity of echoes. The room’s dimensions are also important, especially when it comes to low frequency sounds. Bass notes produce a long wavelength of repeating pressure peaks and troughs several feet in length. When the room dimensions (height, width, depth or diagonal) become an exact multiples of these wavelengths, then a ‘standing wave’ occurs. Instead of the sound radiating out all over the room, it takes on a stationary “standing” pattern of loud and soft points within the room, leading to unevenness of bass. For frequencies with strong standing waves the sound level will vary dramatically with position. Typically base will be strong in the corners or against the wall, and weaker in the middle of the room, where you are setting between the speakers. This phenomenon is often experienced as a lock of bass response of your speakers. Rooms with each dimension the same or close in length, are the worst cases. Small square rooms can push these standing wave frequencies up into the midrange and make them even more noticeable. This is why your voice sounds very “resonant” in the shower. In the end there is little you can do short of ripping out walls and changing dimensions. But more sound absorption material will definitely help. As well as large openings to other rooms and not-so-rigid walls. Now you know why cinder block basements tends to be the worst choice for listening rooms: combining small, closed spaces with highly reflective walls. Instead, choose a living room or rec room. With some soft stuffed furniture and thick carpet you have the basics of a great listing room. This is the ‘Listening Laboratory,’ located adjacent to our R&D lab. The final and most important tests before a restored tube amplifier leaves for its new home with a client are performed here. Its smaller than room 1, but with a high ceiling and plenty of acoustic absorption and dispersion materials critically placed on the side and rear walls. It was specifically designed to support both research and quality control, with facilities to accommodate several amplifiers and speaker systems, as well as our custom designed computerized test and measurement system. We also shoot video footage for online sales displays in this room. Room 2 is also setup for remote controlled “live” switching between amplifiers, speakers and music sources. This allows us to switch between the amp under test and one or more ‘reference’ amps while listening to high resolution audio sources. This is great for determining the sound quality for one tube amplifier over the other, or even tube vs solid state amplifier performance. To do this first we carefully match the volume of the amp under test to that of the reference amp. Then the simple push of a button on a wireless remote allows us to simultaneously switch both the input source and speakers between the two amps with no change in volume or left-right balance. Being able to instantly switch back and forth between amps is critical to uncovering even the most the subtle differences in their performance. Over years of testing we have found that switching between amps while listening to music is the only way to accurately hear subtle differences between two amps. Memory just isn’t good enough to spot the details of differences between what you’re listening to now, and something you listened to a few minutes, hours or even days ago. We also do ‘blind’ A/B tests to see if the listener can identify the different amps by switching back and forth while listening. In addition to listening tests, this room is where we utilize our patent-pending computerized distortion analysis system to monitor amplifier distortion while actually playing music through the amp: Another industry first from AEA. AEA pioneered the technique of distortion measurement using live music back in the early 70’s. (See our Legacy page). With the enormous advances in computer systems since then, we have been able to expand that early work into a remarkable “real-time” system that allows you to see the actual distortion components produced while a amplifier is playing live music through real speakers while you are listening. The industry standard THD measurements, using constant tones from a signal generator (instead of music), with the amp hooked up to a ‘dummy load’ (instead of speakers) is next to useless for telling how an amp will actually sound. Ours is the only measurement system in existence that actually reveals how an amplifier performs in the real world– with real music playing through it and real speakers hooked up to it. You can see this system in operation on many of our sales videos. This is a smaller, more ‘cozy’ room representative of a typical home installation. 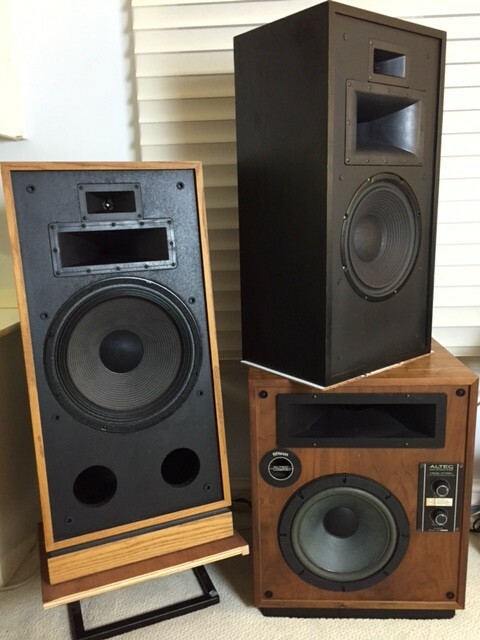 Here we usually have a pair of modified Klipsch Chorus I speakers (one of our favorites for tube amps), Altec Model 15’s, Klipsch Forte II’s and two or three amplifiers, both reference amps and new designs under development. This room allows us to be sure our gear performs at optimal levels in the average home setting, as well as giving us more ‘real world’ variety in our listening environments. This room also doubles as our photo studio, where our photographer creates those beautiful shots of AEA’s restored amps.